6 Foot Gondola Gridwall Display Rack | Candy Concepts inc. 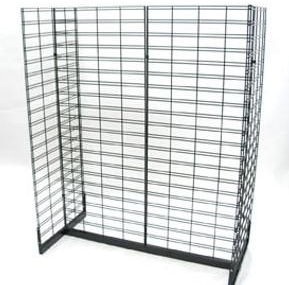 The 6’ Wire Gondola Slatgrid Display Rack lures customers in like a moth to a flame! Overall width of the set-up is approximately four-foot wide. You receive four 24-inch by 72-inch wire steel panels, six connectors, and a metal base with wheels. 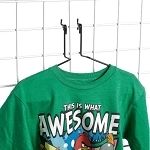 This metal sturdy wheeled base allows for a display you can move to just the right spot in your store full of various garments, clothing accessories, sporting goods materials, kids school equipment plus more. Available in black, white, and chrome, this retail floor fixture is sure to gain the attention of your clients. If you select chrome, remember the chrome materials used to design your metal display rack is a little more expensive, so this display stand will be slightly higher in price. Take a chance and invest in your business by purchasing a new display fixture today!